Modeling the Effects of Prescribed Fire on Nutrient Loads in the Southeastern U.S. Since 1989, scientists at Coweeta Hydrologic Laboratory and collaborators have investigated the impacts of prescribed burning with long-term, interdisciplinary, ecosystem approaches. Studies have examined ecosystem processes such as net primary production, nutrient and carbon cycling, and vegetation dynamics (regeneration, compositional changes, mortality, diversity) in a number of forest types and fire prescriptions (Vose et al. 1993, 1996, 1997, 1999, 2005; Vose 1994, 2000, 2003). Coweeta's research approach uses watershed-scale (water quality and quantity) and within watershed scale (plot level changes in nutrient and carbon cycling, vegetation dynamics) assessment of ecosystem responses to prescribed fire. The watershed approach facilitates extrapolation of small-scale disturbances to larger landscape units. One unique aspect that has been addressed is the long- and short-term impacts of prescribed fire on ecosystem sustainability, using rates and pool sizes of carbon, nutrients, and water as key indicators of sustainability. After nearly a century of exclusion, re-introduction of fire into the current forests of the southern Appalachians will have varying effects on ecosystem properties and vegetation structure and composition depending on fire type (intensity, severity, frequency, timing, and scale) and forest type (current species composition and structure, slope, soils, microclimate, and fuel load). 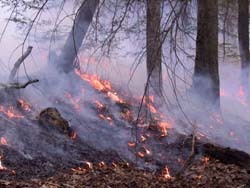 Therefore, there is a need for thorough investigation of the effects of prescribed fire on ecosystem processes in multiple forest types; and knowledge is needed on the interactions between historical fire regimes, current ecosystem structure and function, and ecosystem responses to prescribed fire. To date, Coweeta scientists and partners have evaluated ecosystem responses to fire in xeric, low productivity pitch pine (P. rigida)/mixed hardwood forests; dry, moderate productivity shortleaf pine (P. echinata)/oak forests; mesic, high productivity, mixed hardwood (L. tulipifera/Q. rubra) forests; and Piedmont and Coastal Plain high productivity, pine forests. Restoration burning in degraded xeric pine/mixed hardwood forests was a focus of fire research by Coweeta scientists and partners between 1989-2000. Two large scale fire studies were conducted. The first study, a fell-and-burn treatment with replication, was designed to restore productivity and diversity of degraded pitch pine (Pinus rigida)-hardwood stands with a dense mountain laurel (Kalmia latifolia) understory that prevents tree regeneration. Even though this treatment resulted in high intensity fires, the humus (forest floor Oa layer) and charred leaf litter remained on most of the soil surface after burning (Swift et al. 1993). Total aboveground N losses were significant ranging from 193 to 480 kg N ha-1 across the three study sites (Vose and Swank 1993); however, vegetation growth was rapid and plant diversity increased (Elliott and Vose 1993, Clinton et al. 1993). Because the forest floor humus remained largely intact, stream water quality was not negatively affected; only a short-term pulse in stream NO3-N was observed (Knoepp and Swank 1993) and no sediment entered the stream (Swift et al. 1993). Longer term results from this study were published in later papers (Clinton and Vose 2000, 2007, Elliott et al. 2002, Knoepp et al. 2004). The second study was a fire prescription designed to simulate a wildfire; thus, the fire created a mosaic of fire intensities, ranging from lightly burned (<80°C) at the low slope to heavily burned (>800°C) along upper slopes and ridges (Vose et al. 1999). On the ridge, the stand-replacing fire consumed understory vegetation and ignited the crowns in areas of highest fire intensity. Research demonstrated that prescribed stand restoration burning in mixed pine/hardwood ecosystems has positive benefits to pine regeneration, understory production and diversity, and habitat diversity (Elliott et al. 1999; Elliott et al. 2009). Stream and soil chemistry showed no negative effects following burning (Vose et al. 1999). Small mammals and herpetofauna were unaffected (Ford et al. 1999) and groups of forest floor microarthropods responded differently to the burn treatment (Crossley et al. 1999). Since 2000, Coweeta scientists and partners have initiated two large-scale fire experiments with replication in shortleaf pine/mixed oak ecosystems. In the first study, we used the paired watershed approach with a treatment and control pair at each of three sites. Before and after the prescribed fires, we measured soil CO2 evolution; litterfall; large down wood; forest floor litter (Oi) and fermentation+humus (Oe+Oa) mass, carbon and nitrogen pools; soil, soil solution, and stream chemistry; and vegetation (herbaceous, shrubs, and trees). Indices of soil nitrogen (N) availability showed no significant response to burning on any of the sites (Hubbard et al. 2004). Similarly, soil water and stream NO3-N and NH4-N did not increase after burning (Elliott and Vose 2005a). In the overstory, only a few small sized (5.0 cm< dbh<15.0 cm) trees were killed by the fire. However, significant mortality and subsequent regeneration in the understory was found in the first growing season after the burn. Virginia pine (Pinus virginiana) and white pine (Pinus strobus) decreased in the understory; while, yellow poplar (Liriodendron tulipifera), red maple (Acer rubrum), scarlet oak (Quercus coccinea), and blueberries (Vaccinium spp.) increased in abundance (Elliott and Vose 2005b). Initiated in 2005, a second study examined the effects of fuel reduction and restoration treatments on shortleaf pine/hardwood forests that were severely impacted by a southern pine beetle (Dendroctonus frontalis Zimmerman) outbreak (1999-2003). We hypothesized that fuel reduction treatments (cutting and burning) followed by seeding native grasses would restore these ecosystems to a sustainable pine/hardwood ecosystem (i.e., more open savannas that are less susceptible to future SPB outbreaks and have lower wildfire risk). Specifically, we examined the effects of three treatments: burn only (BURN); cut + burn on dry sites (DC+B); cut + burn on sub-mesic sites (MC+B); and reference sites (REF; no cutting or burning) on these forests. We also evaluated the effectiveness of seeding native bluestem grasses. Structural (down wood, live and dead standing trees, shrubs, herbaceous layer) and functional (forest floor mass, C, and N; soil C, N, P, and cations; and soil solution N and P) attributes were measured before and the first and second growing seasons after treatment. Total aboveground mass loss ranged from 24.33 Mg ha-1 on the BURN to 74.44 Mg ha-1 on the DC+B treatment; whereas, REF gained 13.68 Mg ha-1 between pre-burn and post-burn. Only DC+B sites had increased soil NO3-N, NH4-N, Ca, Mg, and PO4-P and soil solution NO3-N, NH4-N, O-PO4 for several months. We found a significant increase in the density of oak species (Quercus alba, Q. coccinea, Q. montana, Q. rubra, and Q. velutina) on all burn treatments. However, oaks accounted for a smaller proportion of the total stem density than Acer rubrum, other tree species, and shrubs. The high densities of woody species other than oaks, coupled with the fast growth rates of some of these species, suggests that oaks will continue to be at a competitive disadvantage in these pine-hardwood communities through time, without further intervention. We found an increase in herbaceous layer cover and richness on all fire treatments. DC+B had higher bluestem grass cover than the other treatments, and it was the only treatment with increased bluestem grass cover between the first and second growing seasons. Our analysis showed that fire severity explained a large proportion of the variation in overstory response; and fire severity and overstory response partially explained soil NO3-N. These variables, directly and indirectly, explained 64% of the variation in soil solution NO3-N at 30 cm soil depth (within the rooting zone for most plants) and explained 46% and 42% of the variation in herbaceous layer cover and species richness, respectively (Elliott et al. 2012a). In 2002, Coweeta scientists and partners established studies in mesic, mixed-hardwood forests in North Georgia and western North Carolina. This forest type is the most extensive component in the southern Appalachians, yet there had been no systematic studies of ecosystem response to prescribed fire. The objectives of this research were twofold and the linkage between the two project objectives was based on the premise that significant improvements in the application of prescribed fire and in the understanding of fire effects are possible with an increased knowledge of historical fire regimes. Document and synthesize information concerning pre- and post-settlement fire regimes in mixed-hardwood forests in the southern Appalachian region by using pollen/charcoal records, Cherokee Indian tribal records and archeological sites, and USFS and State Forest Service fire records. Paleoecological data derived from charcoal and pollen in lakes and bog sediments provide reconstruction of environmental/fire history and a comparison with other documented accounts of vegetation patterns related to fire history (Clark, unpublished data). The synthesis of current information from the literature and other historical documents (Cherokee Indian Tribal records) established the historic locations of the Indian populations, the kinds of sites which were usually chosen for villages and agricultural fields (Gragson and Bolstad 2007), and how fire was used by Native Americans to modify their landscapes (Cooley 2004). A detailed analysis of USFS and State Forest Service fire records established the historical and contemporary fire regimes, both wildfire and prescribed fire, on state and federal lands in the southern Appalachians (Jurgelski 2003, 2008). Evaluate the effects of prescribed fire in mixed deciduous forests on fuel load reduction and ecosystem structure and function. Most studies in the southern Appalachians have focused on pine/hardwood mixtures on xeric sites. Since these forest types occupy only a small portion of the landscape (about 5%), we know very little about the role of fire or its effects in most of the forested areas of the southern Appalachians. Strong topographic and edaphic variation creates gradients that determine vegetation composition, net primary productivity, and susceptibility and response to disturbance. To fully understand potential uses and effects of fire in the southern Appalachians, studies need to be conducted across vegetation and climatic gradients. To address this objective, Coweeta scientists used a combination of ongoing and new research sites to assess short and long-term responses along these gradients, particularly in the mixed deciduous forests where information was lacking. 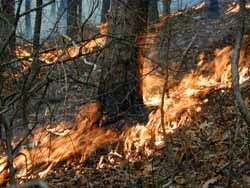 We conducted moderate intensity, understory prescribed fires at three mesic hardwood sites. After burning, all sites lost forest floor mass due to burning; 82 to 91% of the Oi layer and 26 to 46% of the Oe + Oa layer. Soil NH4-N concentrations increased in surface soils, immediately after burning, but returned to pre-burn levels by mid-summer. Burning had no measurable effect on soil solution inorganic nitrogen concentrations and no change in stream NO3-N concentrations (Knoepp et al. 2009). Vegetation response to these understory fires was minimal; no overstory mortality, reduced understory, and a small increase in herbaceous-layer cover (Elliott et al. 2010). Fire can play a significant role in altering runoff, sediment, and nutrient transport in aquatic and terrestrial ecosystems. The typical impact of fire is an immediate change in the physical properties of the soil and forest floor surface, alterations in nutrient uptake and processing, and changes in the amount and distribution of nutrient pools within the ecosystem. While there is potential for wildfire and prescribed burns to pose risks to water quality in the southeastern US, there was little effort to specifically model the effects of prescribed burning on water quality at large spatial scales. This research addressed the needs of land managers to estimate the post-fire risks of flooding, erosion, and contamination of drinking water from sediment and nutrients. Scientists used a combination of field studies and modeling to assess the impacts of varying fire regimes on water quality. For the modeling, we applied and tested nutrient, sediment, and hydrologic cycling models across the mountains, piedmont and coastal plain physiographic regions in the southeastern US. Field study sites were located in the Nantahala National Forest in the southern Appalachians, the Uwharrie National Forest in the Piedmont region and the Croatan National Forest in the Coastal Plain region. Portable automated samplers were installed to measure water quality and quantity, soil solution lysimeters and overland flow collectors were installed to determine surface vs. subsurface contributions of nutrients and sediment. We focused on nitrogen (NO3, NH4), phosphorous (PO4) and sediment because they are key indicators of ecosystem response to disturbance and are important water quality parameters (Vose et al. 2005a, b, c). Prescribed fires in the southern Appalachians can be successful in reducing undesirable midstory species such as evergreen shrubs and invasive white pine, with little to no effect on sediment and nutrient transport to streams (Knoepp and Swank 1993, Clinton et al. 2003, Elliott and Vose 2005a, Elliott and Vose 2006). Maintaining an intact forest floor and promoting rapid vegetation recovery is critical to minimizing the magnitude and duration of sediment transport (surface erosion), sediment delivery (suspended solids) and subsequent water quality responses (Elliott and Vose 2006, Clinton and Vose 2007). Fire managers can influence the effects of prescribed fire on water quality and other ecosystem properties (e.g., soil nutrient loss, vegetation recovery) by limiting fire severity and fire size. Understanding the effects of fire on southern Appalachian ecosystems is complex, because of the long period of fire exclusion and variation in and among ecosystems in terms of community composition and structure, fuel quality and quantity, climate, soil properties, and topography. Coweeta scientists are continuing their work on restoration of degraded ecosystems, evaluating a combination of treatments such as thinning overstory and midstory trees and removing evergreen shrubs followed by prescribed fire. We will continue to use the watershed scale approach to evaluate the impacts on ecosystem services. Syntheses papers have been produced to describe the state-of-the-knowledge and provide forecasting of future forests, fire and their interactions with changing climate (Rocca et al. 2014, Mitchell et al. 2014, Vose and Elliott, in press). Related studies have examined the effects of wildfire on vegetation and nutrient cycling in wilderness areas (Elliott et al 2012b, Elliott et al. 2013). Coweeta scientists provide technology transfer through Fire Ecology Workshops and on-site tours of specific fire studies. Future fire research will focus on whole watershed treatments to understand fire effects on ecosystem services including water quantity and carbon cycling. Cooley, N.E. 2004. Understanding Traditional Knowledge for Ecological Restoration: A qualitative study with the Eastern Band of Cherokee. M.S. Thesis, Northern Arizona University, Flagstaff, AZ, 65 p.
Crossley, D.A., Jr.; Lamoncha, K.L. 1999. Response of forest soil microarthropods to a forest regeneration burn at Wine Springs (southern Appalachians), pp. 1-15 In Proceedings of First biennial North American forest ecology workshop; 1997 June 24-26; Raleigh, NC. Douglass, J.E. ; Van Lear, D.H. 1983. Prescribed burning and water quality at ephemeral streams in the Piedmont of South Carolina. Forest Science 29: 181-189. Elliott, K.J. ; Vose, J.M. ; Swank, W.T. 2000. Fire as a silvicultural tool to improve southern Appalachian Pine-hardwood stands, p.198 In W.K. Moser and C.F. Moser (eds. ), Fire and forest ecology: innovative silviculture and vegetation management. Tall Timbers Fire Ecology Conference Proceedings, No. 21, Tall Timbers Research Station, Tallahassee, FL. Elliott, K.J. ; Vose, J.M. 2006. Effects of prescribed fire on southern Appalachian ecosystems. Proceedings of the 3rd International Fire Ecology & Management Congress, special symposium titled: "Changing spatiotemporal dynamics of fire regimes in the Appalachian Mountains", San Diego, CA, November 13-17, 2006, Washington State University, Extension, 6 p.
Jurgelski, W. 2003. Appalachian Fire History – Overview, potential sources, and possible directions. Report submitted to Coweeta Hydrologic Laboratory (Dec. 12, 2003), Otto, NC: 22 p. in Coweeta Files. Jurgelski, W.M. 2008. Burning season, burning bans: Fire in the Southern Appalachian Mountains, 1750-2000. Appalachian Journal 35(3): 170-217. Knight, D.H.; Vose, J.M. ; Baldwin, V.C. ; Ewel, K.C. ; Grodzinska,K. 1994. Contrasting patterns in pine forest ecosystems. Ecological Bulletins (Copenhagen) 43:9-19. Major, A.E. 1996. The effects of stand-replacement fires on pine and oak communities in the southern Appalachians. M.S. Thesis, University of Georgia, Athens, GA.
Neary, D.G. ; Currier, J.B. 1982. Impact of wildfire and watershed restoration on water quality in South Carolina's Blue Ridge Mountains. Southern Journal of Applied Forestry 6: 81-90. Newman, A.C. 2008. Restoration of shortleaf pine (Pinus echinata Mill.) -- bluestem (Andropogon gerardii Vitman and Schizachyrium scoparium (Michx.) Nash) communities in the southern Appalachians. M.S. Thesis, University of Georgia, Athens, GA. 105 pp. Rosenfeld, B.J. 2004. Developing a new fuel load mapping strategy using: digital photogrammetry; international classification of ecological communities; USDA Forest Service, forest inventory analysis protocols; and disturbance history. M.S. Thesis, North Carolina State University, Raleigh, NC. Vose, J.M. 1994. Effects of prescribed burning on ecosystem processes and attributes in pine/hardwood forests of the southern Appalachians, pp. 81-90 In Opportunities for the hardwood industry to address environmental challenges: Proceedings of the twenty-second annual hardwood symposium, 12-15 May 1994, Cashiers, NC. USDA Forest Service, Southeastern Forest Experiment Station, Asheville, NC. Vose, J.M. ; Swank, W.T. ; Geron, C.D. ; Major, A.E. 1996. Emissions from forest burning in the Southeastern U.S.: Application of a model determining spatial and temporal fire variation, pp. 733-749 In Levine, J.S. (ed. ), Biomass burning and global change, vol. 2: Biomass burning in South America, Southeast Asia, and temperate and boreal ecosystems and the oil fires of Kuwait. MIT Press, Cambridge, MA. Vose, J.M. 2003. The role of fire in shaping the structure and function of forest ecosystems in the southern Appalachians, pp 1-7 In Proceedings, Enhancing Southern Appalachian Forest Resources, Hendersonville, NC. North Carolina State University, Forestry Education Outreach Program. Vose, J.M. ; Laseter, S.H. ; Sun, G.; McNulty, S.G. 2005b. Nitrogen cycling responses to fire in the southeastern U.S., pp. 1-4 In Eastfire Conference Proceedings, 11-13 May 2005, George Mason University, Fairfax, VA.